Can restorative justice programs influence offender recidivism? The traditional way of dealing with crime in society is for the State to intervene by punishing the offender. The punishment of offenders is seen to serve justice through denunciation and deterrence. Some critics of this approach have argued that the focus on offenders ignores victims and the community. In the 1970s, an alternative approach, restorative justice, began to emerge and, particularly in the last decade, has proliferated across North America and other parts of the world. Restorative justice seeks to involve victims and the community in a process that holds the offender accountable for repairing the harms committed by the offender. In many restorative justice programs victims, and often community members, meet with offenders to understand why the crime occurred and discuss how to "make right the wrong". These meetings often result in efforts by the offender to make amends to those that were harmed through some form of restitution or community service. How effective these efforts are in reducing further harmful behaviour from the offender is of growing interest to researchers and criminal justice agencies. Two approaches to answering the question posed were undertaken. First, a review of the literature on the impact of restorative justice programs on offender recidivism was conducted. The review consisted of published and unpublished studies and included studies conducted with both adults and juveniles. Second, a restorative justice program in Canada was formally evaluated with recidivism measured three years after completion on the program. The results from the literature review found that restorative justice programs had a small effect on offender recidivism. Based on 46 studies with nearly 23,000 participants, restorative justice programs, on average, were associated with a decrease of three percent in recidivism. Contrary to expectations, the programs were more effective with adults (8% reduction) than with youth (2% reduction). Providing some form of restitution to victims was the activity most associated with reductions in offender recidivism. Second, an evaluation of a restorative justice program in the city of Winnipeg was conducted. Unlike the earlier report of this program (see Research Summary, Volume 3, No. 6) that had a one-year follow-up, the present evaluation followed the offenders for three years after completing the program. The program participants were compared to a group of probationers with similar offence and criminal history characteristics but who did not participate in the restorative justice program. The offenders who participated in the restorative justice program had lower recidivism rates than the matched group of probationers. With each year during the follow-up the differences in recidivism rates for the two groups widened. At the first year, the restorative justice offenders had a recidivism rate of 15% compared to 38% for the probation group. At the second year the respective rates were 28% and 54% and by the third year the rates were 35% and 66%. Evidence from the general literature indicates that restorative justice programs can have an impact on offender recidivism that ranges from a two to eight per cent reduction in recidivism. Thus, it is worth considering restorative justice approaches in the development of criminal justice policies. The more dramatic effect of the Winnipeg program may be attributed partly to the treatment programming that all the offenders received. This suggests that the effectiveness of restorative justice approaches may be accentuated by the inclusion of offender treatment. Much of the research on restorative justice focuses on the views and satisfaction levels of the participants. The studies that deal with offender recidivism are relatively fewer and many of these are methodologically weak. Continued, rigourous evaluations are needed to build confidence in this non-traditional approach to dealing with crime. Bonta, J., Wallace-Capretta, S., Rooney, J., & McAnoy, K. (2002). 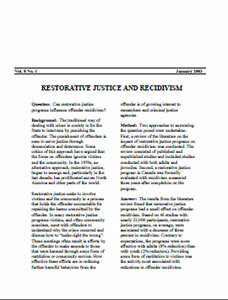 An outcome evaluation of a restorative justice alternative to incarceration. Contemporary Justice Review, 5, 319-338.